Check Out Photographs of Maryland's Historic Roadside Markers! Their History, Albums, Songs, Lyrics, and What They Mean, and More!! We Are Still Having A Splendid Time!! Please leave your name and state/country where you are writing from. Oh Look Out! Part 35 The Beatles "Love"
This is the brainchild of George Martin and his son, Giles. The album was created for collaboration with Cirque du Soleil and was endorsed by Paul McCartney, Ringo Starr, and the widows of John Lennon and George Harrison (Yoko Ono Lennon and Olivia Harrison). 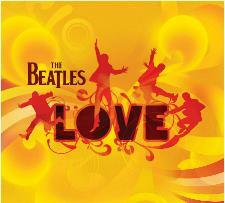 The Love CD contains elements of 130 individual recordings of The Beatles. A complete list has not been disclosed. My list, while not complete, is all that is available at the moment. The CD listing shows 26 tracks, which contain parts of 37 songs. My list herein is comprised of 55 songs, or parts thereof, documented from various sources as well as my own listening of the CD. Another Beatles' masterpiece!! Ever hear a song and wonder if The Beatles recorded it? Now you can find out! Here is the total list of all the songs recorded by The Beatles. and More!! As my introduction to The Beatles and their albums, songs, lyrics and what they mean, we take a look at their history from 1957 to 1970. The Beatles revolutionized pop music - no doubt about it. But was this phrase merely a cliché? Maybe -but it is the only possible response to a group in music history that is as staggering and overwhelming as that of The Beatles. Back in the innocent days of 1963, most of us who grew up with The Beatles could not always afford a record "album," but rather opted for the cheaper singles. Since albums, or LPS as they were known then were out of the financial reach of most of us, and since the oldest Beatle was a mere 22 years old when this album was recorded, the teen audience was the target of EMI records. But, during this time, albums were reserved by the record companies as a shameful cash-in either for a film or one based solely on the strength of a pop single. Only performers like Frank Sinatra and Ella Fitzgerald were allowed the personal artistic statement of a album, that is, until The Beatles. In the first part of this series, we take a look at the Beatles first UK release, "Please Please Me." Released on March 22, 1963, its US counterpart was "Introducing The Beatles," released on July 22, 1963 and re-released on January 27, 1964. Here you'll find the history of the album, the songs and lyrics and what they mean. Only four months had passed since The Beatles released their debut album, and they were back in the studio recording their second. But the time this album was released, and its counterpart "Meet The Beatles," in America, The Beatles were the hottest group in show-business. With this second album, EMI records knew that their fans would buy anything The Beatles released. But, what they did not plan was that this album proved to be a giant step beyond their first, rather hastily pieced together effort, but still nonetheless -great! In my continuing series, we take a look at the Beatles' second release from November 22, 1963, and its American counterpart, "Meet The Beatles." The history, the songs, the lyrics and what they mean are all here! In the early days of The Beatles, the pop business had not yet realized the potential riches to be earned from merchandising through a variety of products. The next best thing they thought was to do a cheap black and white movie. It also solved the problem that The Beatles could now be seen in cities and towns throughout the world that they either could not nor had any intention of visiting personally. What the world and the pop business did not realize, again, was that this movie turned out to be one of the greatest ever filmed. So good in fact that it is used as a model in schools in the areas of style, direction and production. In part three, we take a look at The Beatles' first film, and soundtrack album. Not all the songs on the album were in the film. Wanna know why? Read on! It has been said that the photo on the cover of this album, showing The Beatles with blank stares on their faces, was not exactly intended, but merely was a result of circumstances. Unlike stars of today who are pampered and spoiled every step of the way, The Beatles did not have a moment to bask in their fame between the years of 1963 and 1965. During these two years they were touring non-stop, and writing and recording new songs. Only a few times did they get a week off from touring, but during this time they were expected to write and record, and tape radio shows for the BBC. In Part 4, we take a look at The Beatles fourth album, "Beatles For Sale," released on December 4, 1964. Oh Look Out! Part 5, Help! Following the success of "A Hard Day's Night," this time the studios gave The Beatles a lavish budget, with exotic locations, as well as being filmed in color, but the one thing this film lacked from their first was realism. Although it did not measure up to the success and splendor of their first film, it was still a big success. It grossed impressive numbers in Britain and the United States, as well as other parts of the world. Besides, it is one of the greatest soundtracks ever recorded. In Part 5, we look at The Beatles second feature film, and fifth album, released on August 6, 1965. In Part 6, we look at "Rubber Soul," easily one of the greatest and finest masterpieces The Beatles wrote and recorded. For the first time The Beatles made an album which was more than a collection of singles; an album that was a work of art on its own. "Rubber Soul," marked a new period for The Beatles, a more precise way to make an album. Just as "Beatles For Sale," was the summit of what was known as the British "beat," and "Sgt. Pepper" to come later was their full production extravaganza, and "Revolver," their post-acid period, this album truly marked the beginning of The Beatles giant step into the future. In Part 7, "Revolver," is another of The Beatles masterpieces! Released on August 5, 1966, it was the first album where The Beatles became a consummate studio band. In the studio, they had the freedom to choose exactly the right sound they were looking for in each track. What gave The Beatles the freedom to make this wonderful recording was they were supposed to begin making their third film, but no-one agreed on a script, thus The Beatles had a three-month break to do whatever they wanted. What did they do? They made "Revolver." Truly a Beatles' masterpiece, we take a look in Part 8 at Sgt. Pepper's Lonely Hearts Club Band, released on June 1, 1967. Its influence came from The Beach Boy's album "Pet Sounds." As Paul McCartney said, "the album just flipped me." Although The Beach Boys were a good band, and "Pet Sounds," I believe is their best effort and a great album, there is no comparison to me between the two. What is he main difference you may ask? Simply stated, The Beatles. Take a look at the album dedicated to The Beatles' third film, this time, a documentary, based on a trip with The Beatles across the English countryside. The film was originally released only in the United Kingdom. There are six new songs in this film, but they were not released on an album, except in the United States. Outside the United States they were released on an EP (extended play single) on December 8, 1967. In the US, an album was released on November 27, 1967, that contained the six new songs and five others. It would not be until the CD release that the American version was available worldwide. Do you know the six songs from the film? It is a great album and one of my favorites. Besides the title track it's hard to compete with "I Am The Walrus," and "Strawberry Fields Forever." Due to the album length, I bring you The Beatles (The White Album) in two parts. The Beatles did it again, with another masterpiece, described as the most diverse record in pop history. On one hand this was an amazing outcome, as at this time, The Beatles were on the verge of breaking up, and there was lots of tension. They had business meetings in the studio, beds were there, and people were always in and out. Despite this, "The White Album," is easily one of The Beatles best! Be sure to check out Part B for the remaining song titles and lyrics. This two record set was released on November 22, 1968. What is so unique about this album, is that although it is The Beatles in all their brilliance, it is actually a recording by four solo artists in one band. It is almost if you looked at each track, it would be John, then Paul, then George, then Ringo as solo artists, backed up by the band. It is in a word, phenomenal! In my continuation of The Beatles (The White Album) I bring you the remaining titles. Here we take a look at The Beatles first and only animated film and its soundtrack. Largely done with children in mind, it is none the less a great album. Both album covers are pictured herein. The home page shows the original album release, and the article page shows the 1999 reissue. If you are a collector of Beatles recordings, you have to have both versions of this wonderful effort. But, as good as the original is, you haven't lived until you've heard the digitally re-mastered 1999 reissue. Wow! By design, "Abbey Road," was intended to be The Beatles final album, but things didn't work out as they planned.. The album was released on September 26, 1969. By October 1968 The Beatles had just finished "The White Album." Following this was "Yellow Submarine," and The Beatles also recorded what would become "Let It Be." Within three after the "Let It Be" sessions, they began working on yet another album, which would be "Abbey Road." In the course of one year, The Beatle recorded and released about sixty new songs. Although considered a collection of "throw-aways" at first, it is considered by many to be their best album. The medley alone is genius, and my favorite. Next to "Sgt Pepper" it is their best selling album. The Beatles final album, it was released on May 8, 1970. Although not one of the best, it does have several great tracks. Had George Martin been involved, it would have been among the best! All the Songs and Who Wrote What! All The Songs and Who Sang What! Take a look at the hard to find collection of every album recorded by The Beatles and released in the United States. I'm glad I bought them all then! Commonly referred to as the "Red Album," this was the first collection of hits issued in the United States, with tracks released by The Beatles between the years, 1962 and 1966. Ever wonder what things were like when The Beatles first appeared on the Ed Sullivan Show? Do you know how many times they appeared, and the songs they sang? Find all the answer here! The photo at right is from The Baltimore Sun Paper, (AP Photo), announcing their first appearance on the Ed Sullivan Show. In the photo The Beatles are pictured, left to right; Lennon, Starr, McCartney and Harrison. However, in the photo caption, they are listed as Lennon, McCartney, Harrison and Starr! Here we take a look at that time in America when the United States Government, under President Richard Nixon, tried to deport John Lennon, and the reasons why, as well as a great song dedicated to him, regarding this. Shown at right are the first two pages of the FBI investigation file. Take a look at The Beatles latest collection of #1 hits in the United Kingdom and the United States! If you haven't heard this one, it is a must for your collection. Digitally re-mastered, it brings The Beatles right into your home! Includes links to all the lyrics! Take at look at the two newest songs by The Beatles, their history, lyrics and how these songs began. Also click on the link inside to go to Free As A Bird, The Video Clues. If you ever wondered what the video for "Free As A Bird," really means, you'll find the answers here! Upon watching it have you been able to identify all the songs represented? Here in the clues you'll find (hopefully) all the songs that The Beatles used in the making of this brilliant video. Learn all the facts surrounding the "Paul is Dead" incident of 1969. Was it merely a rumor or a planned hoax? Find out the songs and album covers that support the theory. 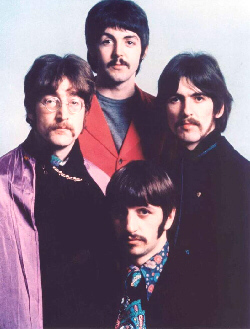 Note: In the picture at right, Paul is the only one wearing a black carnation; the other three Beatles' have red. Learn all about The Beatles famous album "SESSIONS." This was that album that lead to the famous Anthology series. Learn all about the wedding of John and Yoko, and the song, The Ballad Of John And Yoko, that describes their wedding. Lots of Great Pictures! Who Are Those People and Images on the Cover of Sgt. Pepper? 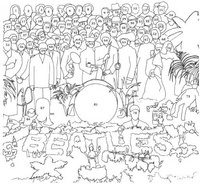 Here you can find out who and what is on the cover of The Beatles masterpiece album, Sgt. Peppers Lonely Hearts Club Band. Do you know which two people were cut from the final picture? Find out here! Did you know that The Beatles went through eight names before deciding on The Beatles? Learn all about each of their former names here! Once EMI Records had issued all the original United Kingdom Beatles albums on CD, they were left with several ideas as to how to complete the digital transfer of the remaining catalogue of Beatles' songs. AS everyone agrees, EMI did the right thing by using the most sensible approach, that is to place all the leftover tracks on two CDs. Included on these masterpieces are their non-LP single. Take a look to learn all about these great songs, many of which were #1 hits! Also, did you know that The Beatles German versions of two of their greatest hits, when actually translated, are not the same songs they are supposed to be? Find out this and much more here!! Ever hear a song and wonder if The Beatles recorded it? Now you can find out! Here is the total list of all the songs recorded by The Beatles. In Britain, or the United Kingdom to be more exact, The Beatles released fourteen EP's, or Extended Play singles. At the time of their original release, these were done so on vinyl, generally in 45 r.p.m. format. Extended Play singles usually had four tracks, although some did have as many as six. Click here to learn all about them, each title, the lyrics, as well as see each EP cover! 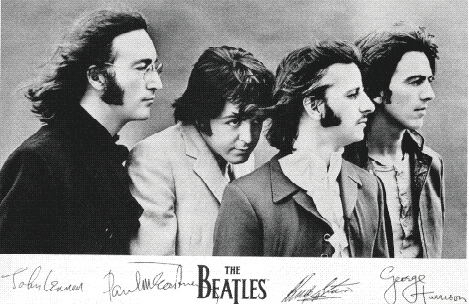 In the United States, The Beatles released very few EP's, or Extended Play singles. At the time of their original release, these were done so on vinyl, generally in 45 r.p.m. format. Extended Play singles usually had four tracks, although some did have as many as six. Click here to learn all about the few that were released! In Britain, and the United Kingdom, The Beatles released twenty-two singles. At the time of their original release, these were done so on vinyl, in 45 r.p.m. format. Click here to learn which tracks were released as singles, as well as information about them, and a picture of the record/CD sleeve. Take a look at the hard to find collection of Beatles' Neckties! 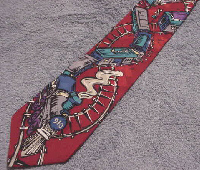 These wonderful ties were made by the Manhattan Menswear Group in the early 1990s. Each tie is masterfully done to represent one of the Beatles songs! If you enjoy this site, you will want to check out About Famous People. Here you can learn all about many famous and historical people, from Great Women, Mozart, Civil War Generals, Actors, and Many More! iamthebeatles.com and I Am The Beatles, Copyright 1970, 1971, 1993-2018 © by John T. Marck. All Rights Reserved. This site was created, designed and written by John T. Marck, Copyright © 1993-2018 by John T. Marck. All articles, and their accompanying pictures, photographs, and line art, may not be copied, reproduced in any form, resold, reprinted, or redistributed without prior written permission from the author and for compensation of any kind. All song/album titles herein and lyrics seen elsewhere on this site and/or contained herein are © Copyright Northern Songs, Music Sales Group, Ltd. All Rights Reserved. International Copyright Secured. The songs of The Beatles, words and music, © Copyright John Lennon and Paul McCartney or George Harrison, or John Lennon or Richard Starkey or John Lennon, Paul McCartney, George Harrison and Richard Starkey (Ringo Starr) ©Copyright Northern Songs, Music Sales Group Ltd. The song titles and lyrics seen elsewhere on this site or on other of my sites, and/or contained herein are for the sole use of educational reference for the readers of this article. All other uses are in violation of international copyright laws. This use for educational reference, falls under the "fair use" sections of U.S. copyright law. The same such reference applies to images/photos of album covers used herein, and /or on other of my sites. 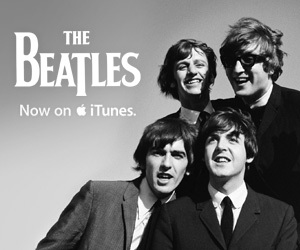 The Beatles ® and The Beatles & Co ® and Apple Ltd. ® are registered trademarks of The Beatles. All information contained in this article, except song titles, lyrics, and photos, © Copyright 1993-2018 by John T. Marck. All Rights Reserved.